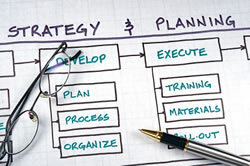 At Level Ten Consulting Group, we can assist in developing a meaningful strategic plan, which may include the definition of your corporate objectives or mission, and outlining specific tactical steps to deploy in accomplishing the objectives. Financial modeling, with the inclusion of all basic underlying detailed support, will provide validation of assumptions as well as forecasted balance sheets, statements of operations, cash flow forecasts, and borrowing base metrics. Our models contain integrated links to other reporting mechanisms so that comparisons can easily be made between the actual and forecasted metrics. The models are not only useful for management decision making, but also for third parties such as equity partners or lenders. Our experience enables us to develop realistic strategies subject to validation, so that the result is an objective and rational business plan with achievable results.